Japanese Episode AG 109: "Yukiwarashi o Tsukamaero!" American Episode 380: "Let it Snow, Let it Snow, Let it Snorunt"
Satoshi and his friends' journey takes them to a snow-covered field. As the group goes into a nearby Pokemon Center to rest, they are approached by a wild Yukiwarashi who is known for being mischievous. 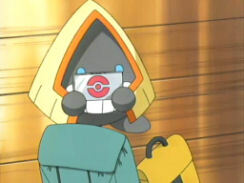 As the Pokemon Center's Joi explains the various pranks it's pulled in the past, Yukiwarashi steals Satoshi's badge case and runs off with it! 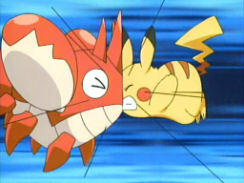 The young trainer from Masara Town runs after the pokemon and is led outside, where he is knocked unconscious while trying to save Yukiwarashi from harm. When Satoshi wakes up, he finds himself in an igloo that Yukiwarashi had made and starts to realize that the pokemon isn't so bad after all. 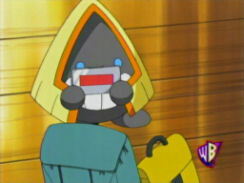 Haruka and the others eventually catch up to Satoshi, but their reunion is cut short when the Rocket-Dan appear. The trio kidnaps Pikachu and Yukiwarashi and start to make their getaway, but they are thwarted when Yukiwarashi breaks free from its cage. After helping Pikachu send the Rocket-Dan blasting off again, the ice pokemon returns Satoshi's badge case. 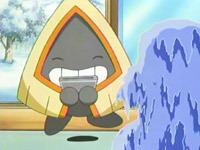 As the trainer starts to leave, Yukiwarashi begins to tug on his clothes, leading everyone to believe that the ice pokemon wants to travel with him. After a brief pokemon battle, Satoshi weakens Yukiwarashi enough to capture it in a Monster Ball! Now that Satoshi has his badges back, he can resume his journey toward Rune City. I like episodes that take place in snowy areas like this for some reason. We haven't seen this much snow in the show since...well, since "The Ice Cave," so it's definitely nice to see the gang return to a place where they're forced to wear something other than the dingy old clothes they've been wearing since Advanced Generation started. The dubbed version returns to doing its most ridiculous edit ever, the badge case edit. The edit is pretty pointless now since we can clearly see the unedited badge case on the title screen for EVERY episode in this season, but I guess 4Kids wants to be consistent or something. I think this may also be the episode that features the most shots of the badge case ("Whiscash and Ash" has been holding that title until now), so this was 4Kids' most labor-intensive badge case edit yet. The first shot of the episode is shortened by two seconds. The episode's title screen, which clearly features Satoshi's unedited badge case, gets two seconds trimmed from it. It's the first appearance of the badge case edit in Advanced Battle! Click here to view more pictures of this edit. The half a second where we see Heigani's and Pikachu's heads colliding while trying to get Yukiwarashi is replaced by a full screen impact star in the dub. Meanwhile, Satoshi smashing his back into a rock and being knocked unconscious is left in uncut. Huh. A second is cut from the shot after the Trainer's Choice commercial break. The bit with the Rocket-Dan showing up before they start their motto is played twice in the Japanese version; once before the show goes to commercial, and again after the show returns from commercials. In the dub, this repeated footage is only played once. Two seconds are trimmed from the shot after Kids' WB! 's final commercial break.